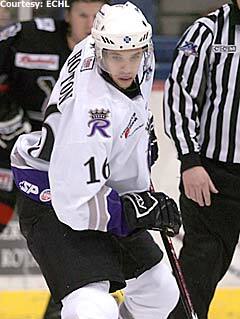 Reading Royals center Brock Hooton leads his team with 22 goals and 31 assists in 62 games. When April 7 rolls around, Karl Taylor may need some Excedrin. As if the Reading Royals coach doesn't suffer enough headaches, what with the constant call-ups to the American Hockey League and injuries his roster has endured over the last few years, Taylor will have to decide who he wants in his lineup for the Kelly Cup Playoffs on the afternoon of the aforementioned date. But with several of his desired players elsewhere -- gritty forward Shawn Collymore was shipped to AHL Hershey earlier this week -- does Taylor risk including a player that he may not have for Game 1 of the postseason? A portion of Reading's playoff roster will be based on whether or not its AHL affiliate -- the Manchester Monarchs -- reaches the postseason. Manchester is currently three points behind the Springfield Falcons for the final playoff spot in the Atlantic Division. Regardless, though, Taylor is excited for the Kelly Cup Playoffs to arrive. "It's looking good," Taylor said of the Royals' postseason roster. "I think I'm going to have some really hard decisions. We welcome those hard decisions, obviously. I think we're going to have to think really long and hard about who we want to add and who we gamble on that's in the American League. It's tough because you're trying to guess what's going to happen. If Manchester misses the playoffs, then that changes our fate. If they make it, it changes our fate as well. Hopefully we know that by the time the roster has to go in." In the meantime, the Royals are in the midst of a fierce battle for home-ice advantage with the second-place Elmira Jackals, who host Taylor's squad tonight at First Arena. A loss would almost guarantee home ice for the Jackals in the opening round with less than 10 games to play in the regular season. A win, however, would pull Reading within three points of Elmira. "It should be tight," Taylor said of the race for second place. "They've got a little bump on us right now, but we play them (tonight). Obviously, that's a big one. We need to win that game, or that might be our last opportunity to close the gap. We're excited about it. Both teams are pretty close and have had very different rosters all throughout the year. It will be interesting to see which teams play each other if we do meet in the playoffs." Taylor's team received a lift earlier this week with the reassignment of Malcolm MacMillan from Hershey. MacMillan's arrival will certainly help ease the blow of losing Collymore, who had 21 points (seven goals, 14 assists) in just 13 games for the Royals. 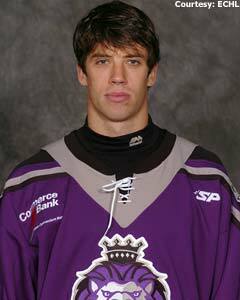 He also appeared in 10 games for AHL Norfolk this season. "Collymore's been playing great," said Taylor, who is on the verge of leading the Royals to the playoffs for the second time in three seasons despite the constant adversity. "To lose him, it's a big loss. He was the best player on our roster at the time he got called. We think it's a short-time thing, but you never know. We've all heard that before. (But) getting Macker back is pretty good, as long as we get him playing tough, hard-nosed and disciplined hockey. He'll be a big asset come playoffs." Royals center Brock Hooton agrees. Hooton, who turned 25 yesterday, leads Reading with 22 goals and 31 assists in 62 games. He also has a plus-13 rating. "We heard MacMillan's coming back and thought that was great," Hooton said. "An hour or two later, we heard Collie's going up. Anytime Collie's been here, he's been on fire. But MacMillan is a huge addition to our lineup. He brings a little bit of a fear factor to teams. He's a really tough player and he's got a lot of skill. He brings a different element, and I think we need that right now." MacMillan will certainly come in handy against the Jackals, considering the rivalry that has developed between the clubs this season. No doubt, tonight's game will have a playoff-type atmosphere. Senators in the 5th round of the 2002 NHL Draft. "It's pretty much playoff games right now with those guys," Hooton said. "We don't like each other. They know that, we know that. They don't like coming to our barn, and we don't really like going to theirs. If we could just steal two (tonight), I think we have a shot at securing second place. If there's an advantage to have, we're going to want to go for it." Hooton thought he had an advantage of getting time in the AHL when he signed a two-way contract with Manchester and Reading last summer. But despite his impressive numbers, the former fifth-round pick of the Ottawa Senators (2002) is on the verge of playing two full seasons in the ECHL without a call-up. Hooton had 17 goals and 25 assists in 59 games for the Phoenix Roadrunners last season. "There's a lot of teams that don't have the best exposure," Hooton said. "In Phoenix, it seemed like the guys who got the shots were the guys on the two-way contracts. It's just a totally different story in Reading. I didn't really know what I was getting myself into. I thought the two-way would work out best for me. Manchester has a ton of guys up there right now. It's just kind of a numbers game with them. I just try not to think about it too much. "You want to make the next step before the years start to tick away. I was really expecting it to be this year. It's a bit frustrating, but I think I've done a pretty good job of just keeping level-headed about it." Taylor has been thrilled with not only Hooton's play this season, but his attitude as well. The Royals coach is confident that a strong performance in the postseason will go a long way for Hooton next year and beyond. "Brock Hooton has been outstanding from start to finish," Taylor said. "It's unfortunate for him with the depth that Manchester has had at forward. He's definitely deserved a call-up in my opinion. He's been great for us. He's been real consistent, and that's been one of the challenges for Brock in the past. I know he's hoping to have a good playoff run with us. We all know how much that matters."